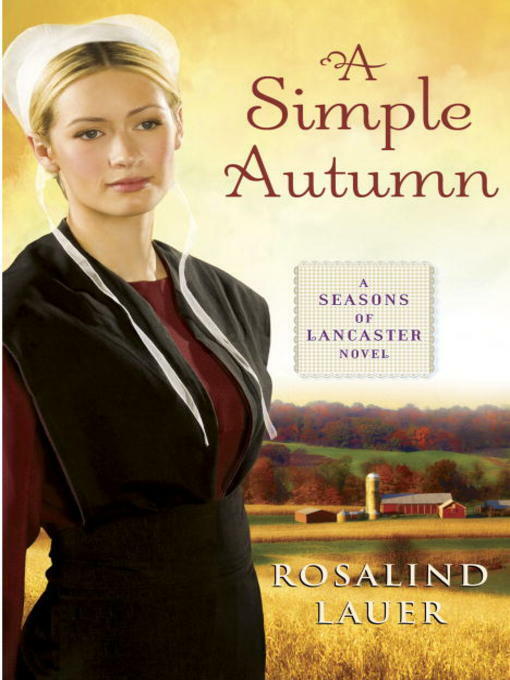 For fans of Cindy Woodsmall and Beverly Lewis, Rosalind Lauer's Seasons of Lancaster novel A Simple Autumn is a wonderful Amish story about two brothers navigating through the troubled waters of love. Jonah King has no desire to leave his close-knit community. All his hopes and dreams lie in Lancaster County, and many of them revolve around his longtime love for Annie Stoltzfus. For years he's been trying to get her to see what burns inside his heart, yet he remains all but invisible to her. Annie's beautiful eyes reflect only her affection for Jonah's older brother—and her sadness when he chooses another. Jonah knows that he must speak up, but when he's around Annie his calm, capable demeanor flees, leaving him tongue-twisted and awkward. Gabe King has been courting schoolteacher Emma Lapp for months, but she insists on keeping their relationship secret. Emma embraces her duty to set a good example for her pupils, but Gabe is in his rumspringa and still wild at heart, riding motorbikes and unwilling to cut his ties to the outside world. Much to Emma's deep sorrow, it appears that she and Gabe are choosing different paths. As swirling leaves of orange and gold dance across the countryside, two brothers must find the courage and faith to reconcile their heritage and their hearts. A beautiful story that explores the clarity of true love, A Simple Autumn is a bounty for heart and soul.